Derby County's winless Championship run was stretched to six matches as they were held at home by Preston North End. The hosts went close inside the opening 40 seconds as Chris Martin set up Jeff Hendrick who fired wide of the target. At the other end, goalkeeper Scott Carson had to be at his best to keep out Paul Gallagher's long-range shot. The point for the Rams moves them up to fourth, six points behind leaders Hull who have a game in hand, while Preston climb two places to 14th. There was no starting place for Derby's recent signing Marcus Olsson, as the Sweden international left-back was named as a substitute by head coach Paul Clement. Despite a fast-paced start from promotion-chasing Derby, the visitors grew into the game and Ben Pearson shot straight at Carson. Preston had scored in six of their last seven trips to Derby and came close after the break when Daniel Johnson put a 20-yard curling effort wide. The hosts had chances to win late on as Jacob Butterfield dragged his shot wide of the far post, while substitute Craig Bryson missed the target from 20 yards. "Of course I am concerned about the run. I would be silly to say I wasn't, but I still have the belief that a victory is not far away. "The message I gave to the players is that we've got to keep going. "They gave all their effort and we've got to keep working hard on the training field, keep positive and keep the belief within us. "There's a long way to go and we've actually gone up a place." "This is a difficult place to come because they have some good players. "Our players stuck to the game plan we spent four or five days working on and the effort the lads put in was unbelievable. "Our keeper has not had a shot to save, whereas theirs has had a few and we created a couple of good chances." Match ends, Derby County 0, Preston North End 0. Second Half ends, Derby County 0, Preston North End 0. Attempt missed. George Thorne (Derby County) header from the left side of the six yard box misses to the left. Assisted by Johnny Russell with a cross following a corner. Substitution, Preston North End. Jordan Hugill replaces Adam Reach. Corner, Derby County. Conceded by Joe Garner. Corner, Derby County. 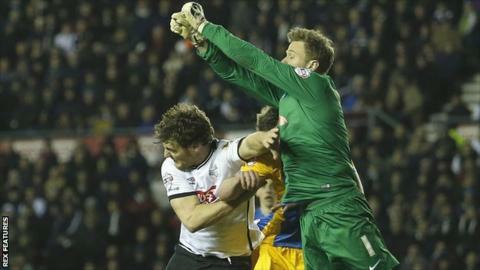 Conceded by Ben Pearson. Foul by Abdoul Camara (Derby County). Abdoul Camara (Derby County) wins a free kick in the attacking half. Attempt missed. Craig Bryson (Derby County) right footed shot from the centre of the box is close, but misses to the right. Assisted by Chris Martin. Attempt blocked. George Thorne (Derby County) right footed shot from the centre of the box is blocked. Attempt blocked. George Thorne (Derby County) right footed shot from the centre of the box is blocked. Assisted by Jacob Butterfield. Attempt blocked. Johnny Russell (Derby County) right footed shot from the centre of the box is blocked. Corner, Derby County. Conceded by Calum Woods. Attempt blocked. Adam Reach (Preston North End) left footed shot from the centre of the box is blocked. Assisted by Greg Cunningham. Attempt saved. Joe Garner (Preston North End) right footed shot from long range on the left is saved in the bottom left corner. Assisted by Greg Cunningham. Delay in match Scott Carson (Derby County) because of an injury. Attempt missed. Calum Woods (Preston North End) left footed shot from outside the box misses to the left. Assisted by Joe Garner. Attempt blocked. Paul Gallagher (Preston North End) right footed shot from more than 35 yards is blocked. Assisted by Greg Cunningham. Offside, Derby County. Stephen Warnock tries a through ball, but Jeff Hendrick is caught offside. Corner, Preston North End. Conceded by Stephen Warnock. Attempt missed. Jacob Butterfield (Derby County) left footed shot from the left side of the box misses to the right. Assisted by Stephen Warnock. Attempt blocked. Jacob Butterfield (Derby County) right footed shot from outside the box is blocked. Assisted by Chris Martin. Offside, Preston North End. Paul Gallagher tries a through ball, but Daniel Johnson is caught offside. Corner, Derby County. Conceded by Tom Clarke.